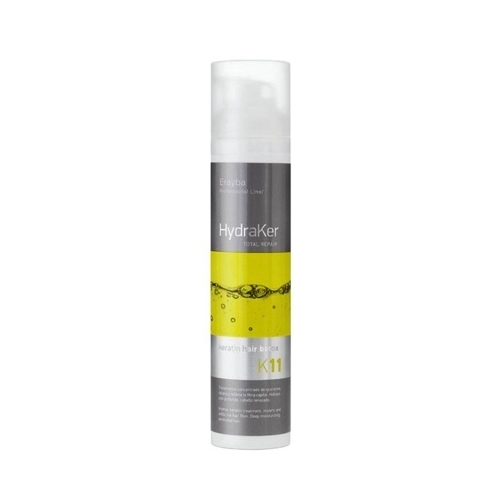 ERAYBA K11 HYDRAKER KERATIN HAIR BOTOX 100ML – HAIRDEPOT - Hair & Scalp Care Products, Prevent Hair Loss, Shampoo, Conditioner, Treatment, Styling, Appliances and more! Intense Keratin and Argan Oil therapy, absolute moisturized and renovated hair. Paraben free, salt free, sulfate free and hypoallergenic perfume. For damaged hair that needs special care and deep moisture. Enhanced hair reconstruction from inside out, hair protection, natural shine, nourishing and smoothing effect. Combine the HydraKer series for different therapy rituals and bring back your hair´s natural beauty. Intense keratin hair treatment, argan oil and thermal lipid-complex, it repairs and refills the hair fibre. Completely renovated hair. Deep moisturizing system.